How many sales do you get from your law firms website? Are you regularly booking appointments, getting new leads, or responding to inquiries for more information? If you’re frustrated by a lack of results from your website (or if you don’t have a website yet), then it’s time to examine what makes a good website work. Good Law Firm Website Design just means a great user experience, one that keeps a potential customer on your site long enough to take progressive action with your business. Put simply, the pictures alone aren’t nearly as important as the ability to convert. What does it mean to CONVERT when we’re talking about a Lawyers Website? Converting is the turning point – when the person browsing on your website clicks a button or a link to subscribe to your email list, book an appointment, download more information, or buy a product. Conversion is the goal of every single page on your website, whether you’re asking someone to give you their email address, share your latest blog post, or make a purchase. A good Law Firm Website Design is as valuable as your best salesperson. The good news is that you don’t have to sacrifice on style or substance when you know the secrets of good Website Design. These two work hand in hand to attract, convert, and delight your customers so they turn into your biggest fans. Get Your FREE Law Firm Marketing Guide? You could use a few more raving fans, couldn’t you? Then get your hands on our FREE Law Firm Marketing Strategy Guide right now. 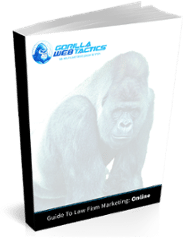 Inside, you’ll discover the two most important elements of a good Law Firm Website Design – plus seven more hyper-specific secrets to online marketing in the simple, no-nonsense language you’ve come to expect from Gorilla Webtactics. Turn your website into a lead-generating machine!